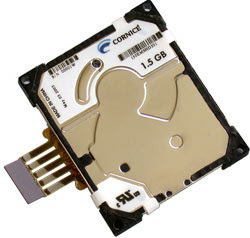 I bought a usb data store with a broken microdrive for 10 bucks. I wasn't sure about hdd being broken in it but I thought it's worth 10 bucks even if it is. It was kind of beyond repair (didn't spin the disc up, just clicking) so I took it apart. Thought I'd put some piccies up.